One of the old sculptors of the original[*scrambled*], and several different companies. But he didn't stop there. Texan scrunts, female scrunts, regulars, commandos, enough for a substantial and varied army. And now insanely mutated freak Psychic Scrunts. More disturbing lysergic imagery wasn't seen in the industry for a while! These are the Grymn, sculpted by Kevin White. A large range of high-tech, beardless, space dwarfs with massive guns. The range includes dwarf women, several support weapons, power armour, separate head- and weapon kits and more stuff to come. A brilliant line and enough variation to build an entire army. 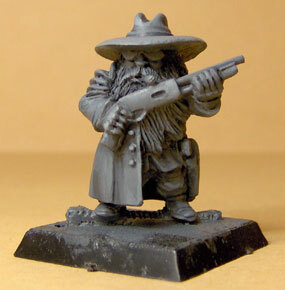 These dwarves were made for Panzerfaust, a fantasy World-War II game. Useful as Nazi Dwarfs From Outer Space mercenaries, to give that cult B-movie edge to your games. 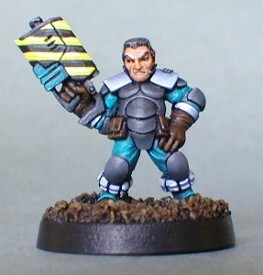 Of course they could also be painted as chaotic dwarfs or bikers in denim suits. Very nice sculpts. They also have somewhat smaller French gnomes. Sculpted by Mike Owen with Steve Blease. 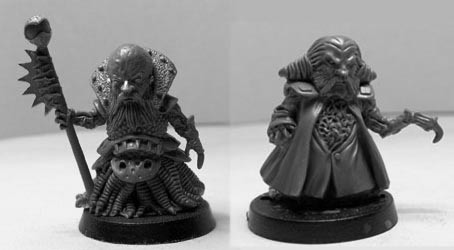 A very nice range of space dwarfs are these Dvargs. 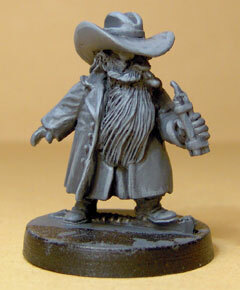 At first released as a very limited edition released by the sculptor himself as Outcast Miniatures. Black Hat bought the line and expanded the range to a nice little skirmish team. These beauties were released by Harlequin in the nineties but shortly thereafter were forced underground. Recently they were re-released to herald a renaissance of Space Dwarves. Forage caps, padded armour and smoking cigars, what more do you want? Meant to be a fantasy dwarf but with the builders helmet and massive guns very suitable as a space dwarf character in mesh armour. It comes with a choice of heads and weapons. 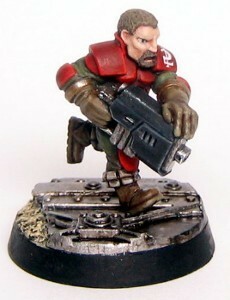 These power armoured little ones are cast in resin and could be great tunnel fighters. The halftrack is of course very useful too as a fast heavy support. Em4 miniatures also sold the halftrack in metal for a while. Actually these are fantasy miniatures with a strong WW1 theme. Still, they might work in a dark future setting. 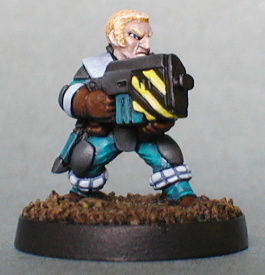 The black powder weapons have wooden parts, but the imperial German-ish uniforms are cool. 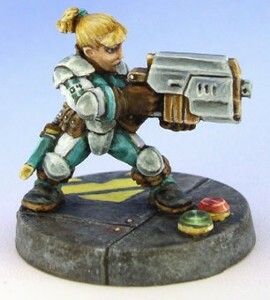 Some other mini’s like the crossbowmen have conversion potential too. Sculpted by Bob Murch. 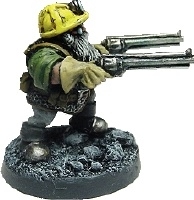 An interesting squad of realistically proportioned dwarfs is produced by this Russian company. Dynamic and with good character and with old-school equipment. Report to page 2 of the showcase.